The iNET-400 system is a low cost card cage that attaches to Windows computers via USB 2.0. The advantage of a card cage is that you can select which I/O modules to install as needed to build a customized system. The instruNet card cage typically has one A/D measurement module and additional modules provide signal conditioning. The conditioned analog signal is routed to the A/D module via the backplane. This is dramatically different from comparable systems which place A/D measurement electronics on each module. The advantage of the iNET-400 topology is cost. After the 1st module is installed, additional iNET-400 channels are conditioned at a very low cost per channel. 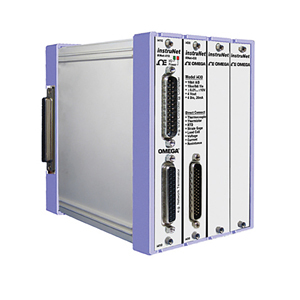 iNET-400 measurement modules have universal inputs that enable one to directly connect each channel to one of: thermocouple, thermistor, strain gage, load cell, counter/timer, RTD, voltage, current, resistance and accelerometer. Absolute accuracy for all of these sensor types is specified. In some cases, the end user adds an external shunt resistor. The advantage of universal inputs is cost. The iNET-400 card cage provides 4 slots, and multiple iNET-400’s can be bolted together by the end user, side-by-side, to create an 8, 12, or 16 slot system. In many applications, one iNET-400 with 4 slots is sufficient. The iNET-400 card cage is 15 D x 11 W x 14 cm H (6 x 4.5 x 5.6") in size. The slots are numbered such that #1 is the left-most slot, #2 is to the right of #1, and so forth and so on. Cards are held into position with jackscrews that are tightened with a slotted screwdriver. Slot #1 is a special slot and is used to interface to a computer. iNET-312-8 desktop power supply to the iNET-410 interface card in slot #1, which in turn routes that power to the card cage backplane (i.e. pcb at back of card cage that attaches to all cards). See PDF attached for illustrated diagram. The iNET-400 Card Cage needs at least one iNET-430 A/D card if analog voltages are to be measured. The iNET-430 cards includes an A/D converter and serves this purpose. The iNET-420 and iNET-423 cards contain various signal conditioning circuits and route signals along the backplane to the iNET-430 for measurement. This happens automatically and does not require programmer intervention, other than insertion of cards and attaching end user signals to the card’s front panel connectors. Each instruNet Network is controlled by an instruNet DSP controller card that attaches to a Microsoft Windows computer. The iNET-240 attaches to a free USB 2.0 high speed port (requires Windows ≥ XP Sp2). Each Controller is an independent computer in itself that utilizes a powerful 32-bit DSP processor and onboard RAM to control all aspects of data acquisition along its network. All real-time tasks are off-loaded to this processor, therefore the host computer is not burdened with real-time issues. Between 1 and 4 controllers can be installed, space permitting, since each controller operates independently. Each instruNet network supports up to 8 instruNet iNET-400 card cages. These devices are connected in a daisy-chain configuration to form a chain of Devices. Each network can be up to 300 meters long. All networks are anchored with an instruNet Terminator at the far end, and an instruNet Controller at the near end. This makes instruNet a cost effective method for designing large scale, high speed, multi-channel data acquisition systems. instruNet Version ≥ 3.0 software requires Windows XP, Vista, 7 or 8 (XP/VS/7/8) computer with at least 256MB of RAM Memory and at least 256 MB of free disk space. The iNET-240 USB controller requires 32-bit or 64-bit Windows XP SP2 (service pack #2) or newer. • Two DB25 connectors allow daisy-chaining multiple iNET-400 card cage devices to one instruNet controller card. • Front panel red power light shows presence of 5V, 12V and -12V power. • Front panel green I/O light blinks when computer communicates with card cage. • Includes one DB25 male to female 3 m (10') cable. The iNET-420 provides 20 single-ended (SE)/10 differential (DI) voltage input channels and 4 universal digital I/O (20 mA sink, -10V to 30V) and requires the iNET-430 A/D module to measure voltages. The iNET- 420 connects directly to voltage, thermocouple, thermistor, RTD, load cell, strain gage, potentiometer, current and resistance inputs. -10 to 30V) and requires the iNET-430 A/D module to measure voltages. The iNET-423 connects directly to voltage, thermocouple, thermistor, RTD, load cell, strain gage, potentiometer, current and resistance inputs. Each input channel passes through it’s own amplifier with a software selectable gain of 1 or 64 and optional low pass filter. The 8-pole iNET-500 analog low pass Butterworth filter daughter board is ideal for anti-aliasing. Between one and six filter daughter boards can be installed onto each iNET-423 card (one per channel). There are four different analog low pass filters, each with a different cut off frequency: iNET-500-380HZ, iNET-500-1KHZ, iNET-500-3300HZ and iNET-500-10KHZ. The iNET-430 provides 16 single-ended (SE)/8 differential (DI) voltage input channels with a 16-bit A/D converter, 2 precision analog voltage outputs (±10V, 14-bit D/A), 2 analog voltage outputs (0 to 10 V output, 8-bit D/A) and 4 universal digital I/O (20 mA sink, -10 to 30 V). The iNET-430 connects directly to voltage, thermocouple, thermistor, RTD, load cell, strain gage, potentiometer, current and resistance inputs. and 16 digital I/O (200 mA sink, -10 to 30 V). NET-400 cards are installed by the end user into an instruNET card cage that is 4, 8, 12 or 16 slots wide. Each card is 13 x 2.5 x 13 cm (5.1 x 1.0 x 5.1") in size. Below is a list of available cards. iNET-410 The iNET-410 connects card cage to windows computer via an instruNet controller. The following table shows maximum aggregate sample rates for an iNET-240 USB controller attached to an iNET-400 card cage. To calculate the sample rate for each channel, divide by the number of channels attached to the iNET-240 controller. For example, if the maximum aggregate sample rate is 166K samples/sec/controller, and you digitize 4 channels, then you could digitize each channel at 41Ks/sec/channel. Up to four iNET-240 controllers can be attached to a computer to increase total system throughput. Model No. ±10V Range ±5V Range ±1.2V Range ±10mV.. The table below shows which sensors directly connect to each hardware product. The numbers in the table refer to number of channels. The following sensors require an external shunt resistor: RTD, thermistor, resistance measurement, current measurement, 1/4 bridge strain gage, and 1/2 bridge strain gage. Thermocouple sensors require an iNET-510 Wiring Box attached to the iNET-400 card. For user manuals and application notes visit the instrunet web site. instruNet network terminator and intruNet World software on CD (requires iNET-312-8 power supply). 참고: Comes complete with CD, including instruNet World Software and user manual.